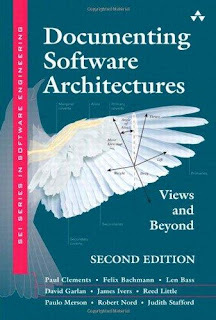 P. Clements et al., Documenting Software Architectures: Views and Beyond, 2nd ed. Addison-Wesley Professional, 2010. N.Medvidovic & R.N. Taylor. A classification and comparison framework for Software Architecture Description Languages. Provides a classification and comparison of various architecture description languages. B. Tekinerdoğan, Classification and Evaluation of Software Architecture Design Approaches, chapter 3 in PhD thesis: Synthesis-based Software Architecture Design, University of Twente, Dept. of Computer Science, The Netherlands, 2000. Provides a classification and evaluation of contemporary software architecture design approaches. Describes the risks and obstacles of these approaches. B. Tekinerdoğan, Architecture Synthesis Process, chapter 4 in PhD thesis: Synthesis-based Software Architecture Design, University of Twente, Dept. of Computer Science, The Netherlands, 2000. Defines the synthesis-based software architecture design approach (Synbad) that aims to solve the problems of architecture design approaches. P. Kruchten, Architectural Blueprints- The "4+1" View Model of Architecture, IEEE Software, Vol 12, No. 6, November 1995. Describes different views/structures of software architecture. L.Dobrica & E.Niemela. A survey on software architecture analysis methods. IEEE Trans. on Software Engineering, Vol. 28, No. 7, pp.638-654, July 2002. Describes a survey and comparison on the popular software architecture analysis methods such as SAAM, SAAMCS, SBAR, ATAM etc.